Leighton has earned the nickname “Mr. Happy.” He is full of smiles and rarely cries. 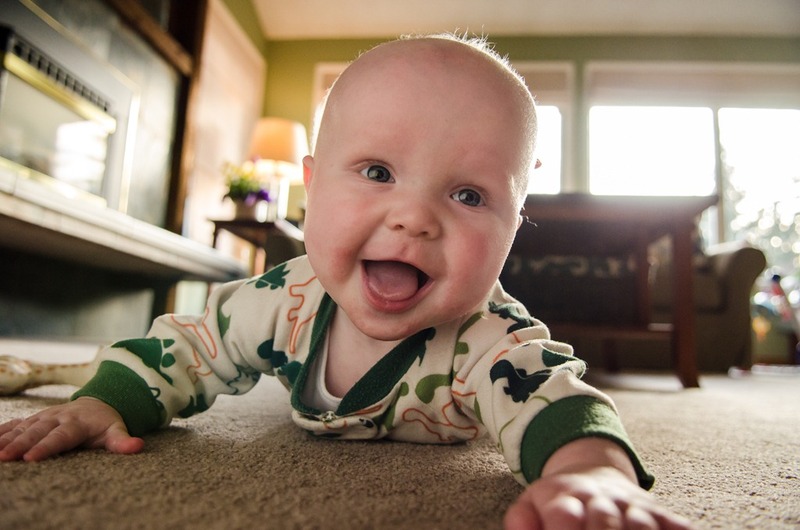 Although he enjoys his cuddles, he has a lot of fun on the floor or in his bouncy seat. Play is rather interactive with us and a good old Bill Cosby style zerbert to the belly or neck is almost guaranteed to produce some giggles. It is also obvious that crawling can’t come soon enough for him. He is frustrated that he can’t get to his toys when they are out of reach. Scooting and rolling does help sometimes, but it clearly isn’t satisfying him. Its probably only about 6 weeks until he starts crawling, which will be fun, yet another level of chaos for sure.